"This delicious scallop dish only takes a few minutes to make and is to die for. 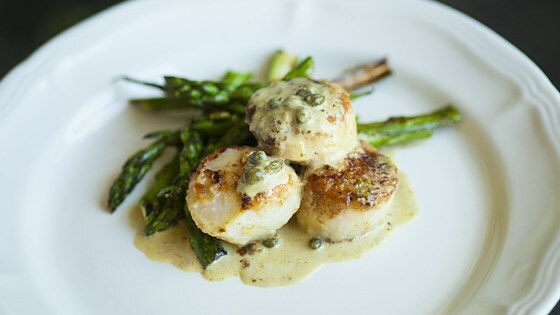 Serve the scallops as they are or with some crusty bread, rice, or pasta." Season scallops with salt and pepper, then dredge in flour. Melt butter in a skillet over medium heat and add scallops. Cook for 1 to 2 minutes per side. Add pesto and capers; mix well. Stir in heavy cream and bring to a boil. Remove from heat and serve. Watch how to make this delicious scallops recipe! This is FANTASTIC ! Make it exactly as the recipe call for. You will make it again. Rich and decadent. I rarely cook scallops, but they were on special, and I was planning guests. They, we all, loved this. Served with roasted veggies and salad. I thought it was delicious, but very rich. I made a very small amount and could only just get through it. I will certainly make it again. I also intend to try it with fish.